In sniffing around for information regarding one of my 2nd G-grandfathers, William Hurst (1827-1897) I stumbled upon this ancient news article about one William Hurst who was “on the road to Kentucky” but in Tennessee. We have quite a few Berry’s in my father’s family tree: Thomas Berry is my 6th G-grandfather but his death dates don’t line up with the date I have for him, nor did he use “J” as an initial. But never mind, it’s fun putting pieces of the puzzle together, whether it’s true or not. This article may be reporting a story where my 2nd G-grandfather on my mother’s side murdered my 6th G-grandfather on my father’s side “in self defence…” The news items was huge: it appeared in all the major newspapers of the day. This article is from the Knoxville Register (Tennessee) — read on. The following contains a statement of the most horrid and deliberate murder which we have heard of in modern times. It may be relied on as authentic. — Knoxville Register. William Hurst shot Thomas J. Berry, who expired in a short time after. Ths parties brothers-in-law; bad feelings had existed between them; the deceased had occupied the house where Hurst now lives; had moved to the Crab Orchard. in Kentucky, with his family; returned a few day back to this neighborhood, as stated, with a view to have satisfaction. On the day of the fatal deed, Berry (whose father lives in this neighborhood) borrowed a gun of one of his brothers, walked past Hurst’s house several times, and stopped out of sight. Hurst’s eldest son discovered him, and hallooed to his father that Berry intended mischief. Berry then came in sight, and walked toward Hurst and his wife, both then standing in the road. On nearing, Berry levelled his rifle. Hurst got hehind his wife and used her as a shield, Berry still dodging to get an aim or sight to shoot Hurst. In the mean time, Hurst sent his son to borrow a rifle. This Indian struggle lasted fifteen or twenty minutes, the contending parties being some three feet apart. Berry finding he could not get a shot at Hurst, without probably hitting his wife, which he did not want to do, took the rifle in one hand, and drew his butcher knife with the other. In the act of doing so, Hurst’s son handed his father a loaded rifle, who instantly shot Berry through the body mortally. Berry also fired, but missed, the ball grazing the side of Mrs. Hurst’s head. The two rifles cracked within a second of each other, Hurst firng first. After being struck, Berry made an effort to reload, in a few minute’s took off his shot-pouch, laid his rifle against the fence, and soon fell and expired. 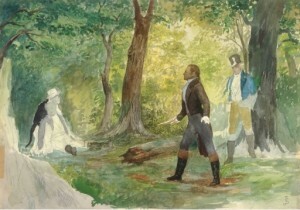 After falling, water was handed to him; he spoke a few words — that he had come to kill Hurst, but Hurst had killed him. Hurst asked his forgiveness, and Berrv gave him his hand in token, and in doing so, expired. Hurst gave himself up, was tried by a called court next day, and acquitted. Berry has left a widow and small family in Kentucky. When Berry walks towards “Hurst and his wife” who is “his wife”? Hurst’s? or Berry’s? why did Berry not want to shoot this woman? Were both Mrs Berry and Mrs Hurst there? Upon even further sniffing, I found out that J stands for Jefferson, and that he left two infants and a wife behind. What the article above doesn’t tell us is that Mrs Berry died very soon after this article was written. We know this because Berry’s we have documents that show that the children were put in the guardianship of a Mr Owen because neither parent was alive. So, Hurst hide behind Mrs Berry because they were having an affair and Berry wanted to catch them in the act? And in that we know that a) the mystery woman was “grazed” by the bullet, and may have died; and b) Mrs Berry died that year, be could leap to yet another conclusion: that Berry accidentally killed his wife in addition to being killed by William Hurst in “self defence”. Sounds like an opera to me.